However, the truth is, Calligra Suite is a mature office suite, with a solid set of basic applications, as well as an integrated, often innovative set of utilities, and at least two truly outstanding tools that have developed their own popularity outside of Calligra Suite. Although some Calligra applications are unmaintained as I write, the integration of the suite as a whole makes it well worth a closer look. Calligra Suite is now the only descendant of KOffice, the KDE Office suite. Between 2010-2012, Calligra and KOffice co-existed, but Koffice became officially unmaintained in 2014 after two years of inactivity. Today, Calligra is distinguished by its efforts to produce versions suitable for mobile and embedded devices. On the desktop, all applications are fully themeable, and favor what I call a cockpit design, with as many features as possible arranged in sidebars. The result can be overwhelming to new users, but has the advantage of placing common features a click or, at most, two clicks away. Office suites center around three main applications: a word processor, a spreadsheet and a presentation application. In Calligra Suite, these applications are Words, Sheets, and Stage. All three include tools for drawing simple diagrams that are comparable to the ones included in LibreOffice. Words has a reasonable set of features displayed on a side bar. Its citations and bibliography tools have the advantage over LibreOffice in that they are specific to each file, rather the entire application. However, Words is missing such tools as text frames for layout and master documents that allow long files to be divided up into smaller ones when working. Advanced LibreOffice users may also miss some types of styles, such as those for pages and frames. Although, that said, Words’ implementation of paragraph and character styles is reasonably complete, and includes tabs for setting up lists that allows much of the customization in Writer’s list styles. Overall, it is equivalent to Google Docs. In many ways, Sheets is a close rival to LibreOffice’s Calc. While its interface for setting up functions is harder to use than Calc’s, the number of functions and the available tools such as Validity and Goal Seek run a close second to Calc’s. An oddity of Sheets is that cell borders are turned off by default, but anyone who dislikes this default can easily create a template in which cell borders are turned on. Few users will miss having cell and page styles, since few Calc users bother with them. 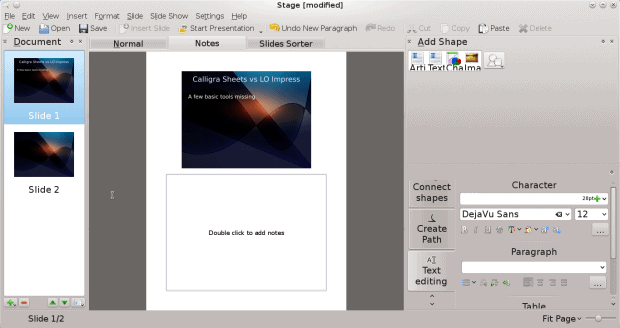 Much the same can also be said about Stage in comparison to LibreOffice’s Impress: a few tools are missing, such as screens for preparing outlines or handouts, but the basic functionality is present. If anything, Stage is more convenient than Impress, opening with a strong set of basic templates, and adding text frames more easily than Calc. Unusually for a slide application, Stage does not default to bullet points when adding text. Like Calligra’s other applications, Stage focuses on basic functionality. In general, Calligra’s basic apps run second to LibreOffice’s equivalents — but they are a close second. As a rule, if Google Docs meets your needs, then Words, Sheets, and Stage should be more than adequate for you. Besides the standard office applications, Calligra Suite includes several diagramming and planning utilities. Karbon, for example, is a vector graphics application. It is comparable to Adobe Illustrator in intent, but is currently unmaintained, which means that its development lags behind that of other Calligra Suite applications or Inkscape, the most advanced free vector graphic program. 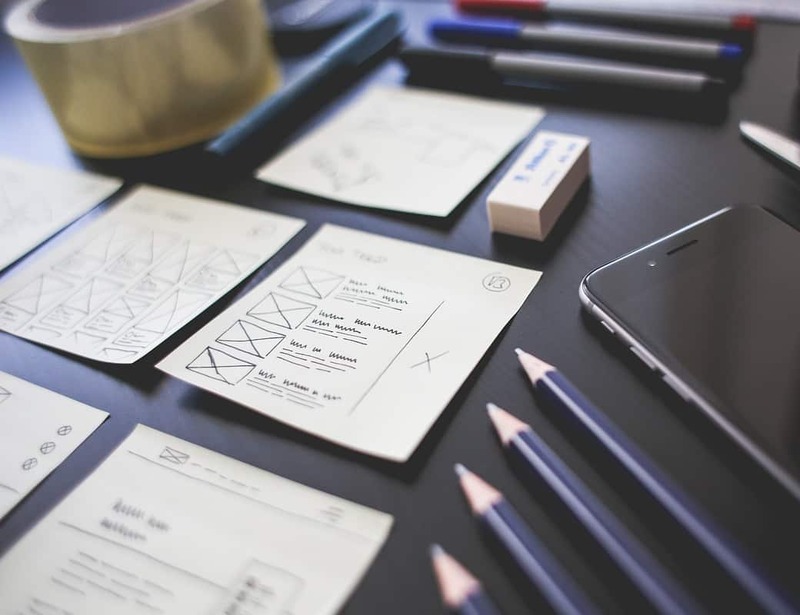 Plan, Calligra’s project management application is similarly unmaintained, although, unlike Karbon, has a full enough set of features to be usable. 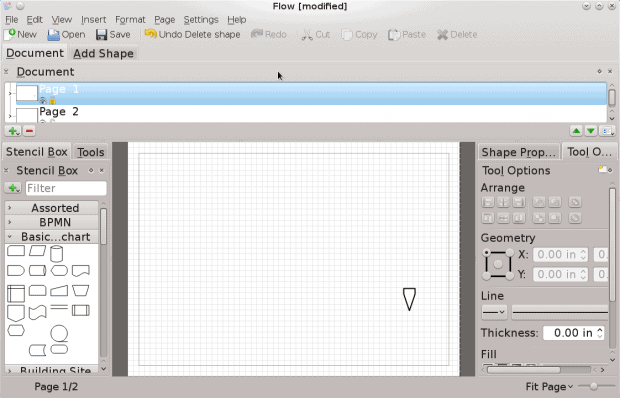 By contrast, Flow builds on earlier charting and diagramming applications like Dia and LibreOffice Draw, assembling a collection of libraries that rivals Visio. Best run full-screen, its main fault is that its libraries are undocumented and require users to look up the subject matter in order to use the various shapes properly. Flow’s strength is its collection of libraries for diagrams. Other minor applications are non-traditional, but welcome additions to the concept of the office suite. Author is a tool intended for active writers. Although so far, little differentiates Author from Words, it includes a full-screen Distraction Free view, and other features for professionals and would-be professionals are also planned. Another innovative application is BrainDump, designed for brainstorming and other forms of free association planning. BrainDump takes a few moments to learn, but, once mastered, is a welcome alternative for those who dislike formal outlining and prefer more informal methods of planning. Two Calligra Suite applications have become popular enough that they are semi-independent: Kexi, a visually-based database creator, and Krita, a paint and graphics editor. 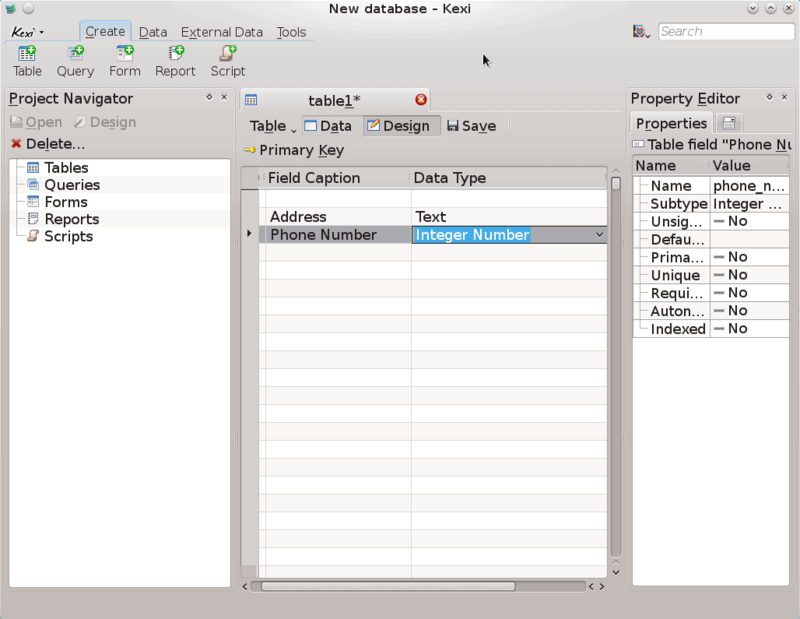 Kexi is comparable to Microsoft Access and Oracle Forms, as well as LibreOffice Base. It is a fully developed application, supporting tables, queries, and forms, and can be used to add and process data, and perform general queries as well. The wizard that it runs when creating a new database helps to reduce the fears and unfamiliarity that many users feel when dealing with databases. Although its actual editing window is less user-friendly, having the Property Navigation pane on the left and the Property Editor pane on the right is enough so that users can quickly learn database characteristics if they do not already know them. Kexi declared its independence by launching a web site independent of the rest of Calligra Suite, and a few years ago there was talk of a Kexi Foundation. However, the project apparently became overly ambitious, and its web site currently indicates that ports to OS X and Windows are no longer in development. Still, on Linux, Kexi remains one of Calligra’s most successful applications. 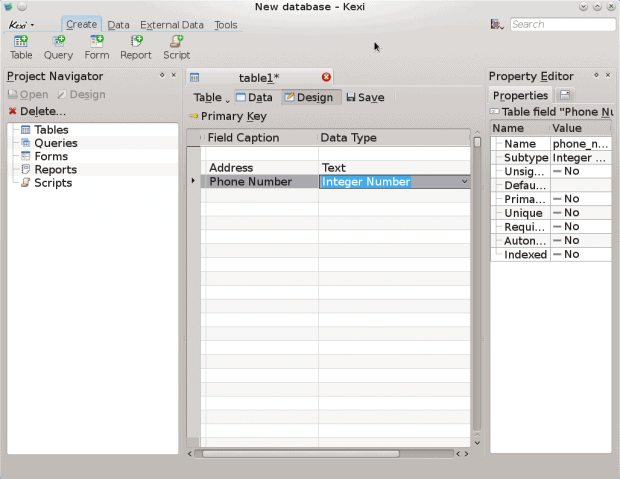 Kexi is a visual tool for creating and managing databases. However, Calligra’s largest success story by far is Krita. Thanks to consultations with professional artists, Krita has become a modern rival to GIMP, and last year won the Artist Choice Award from ImagineFX magazine. 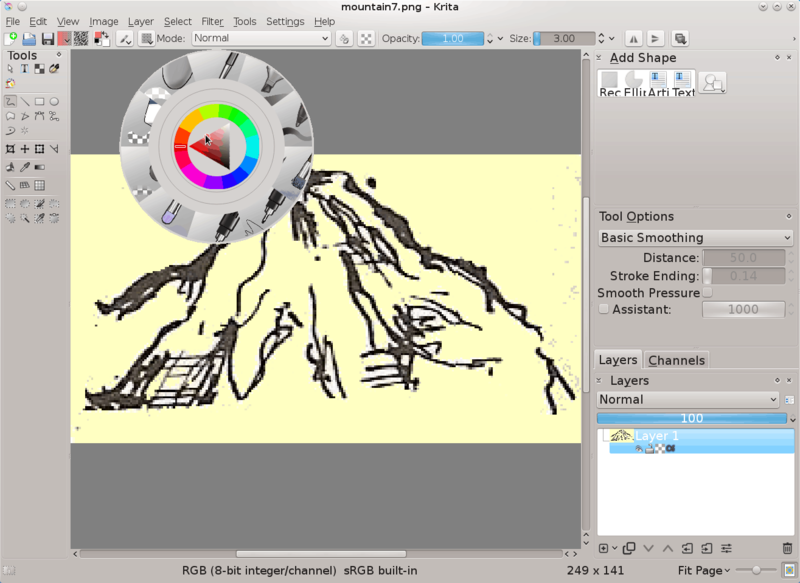 Krita is particularly known for its brush features, which rivals those of Corel Paint, as well as for an interface that can be used to quickly customize the editing window for different projects. Suffering from a lack of current documentation for years, Krita has finally remedied that problem, a step that should only increase its already high popularity. Run by it own foundation, Krita releases versions independently of Calligra Suite, but continues to be included in Calligra Suite. The paint tool Krita is Calligra Suite’s breakout success. 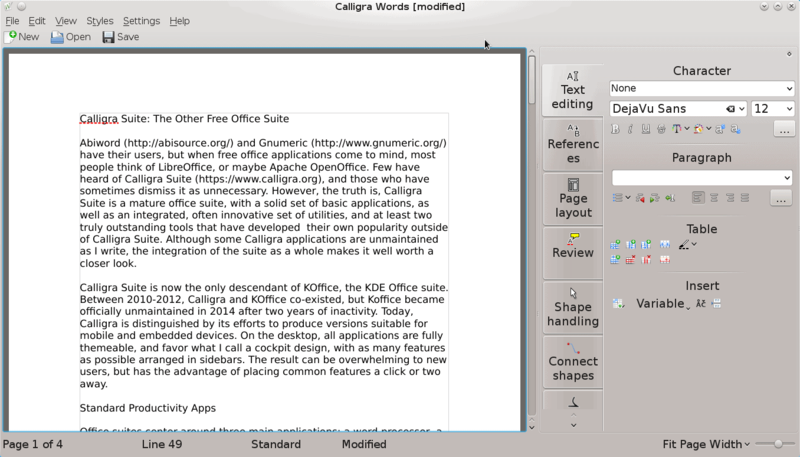 Calligra Suite still falls somewhat short of LibreOffice so far as the features in the basic applications go. However, its interface is cleaner and more efficient, and its integration of related applications is stronger as well. In particular, Flow and Krita offers a much better user experience than LibreOffice Draw — as well as a more complete tool set. 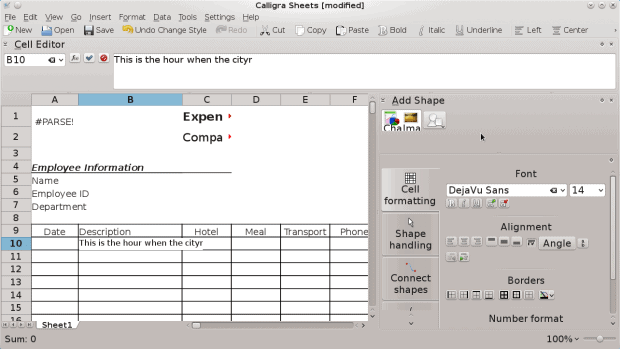 However, if you do experiment with Calligra, a word of warning: Do not let the fact that Calligra Suite uses Open Document Format lure you into imagining that its output is fully compatible with that of LibreOffice or OpenOffice. Some features Calligra does not support, and therefore does not know how to render. In other cases, it seems to render features slightly differently than LibreOffice or OpenOffice. Consequently, importing or exporting from Calligra Suite can sometimes be only slightly better than importing from Microsoft Office. There’s no question that Calligra Suite would benefit from more developers and more donations. However, even in its current state, it remains one of the most under-rated collections of free software today, especially among large projects. Cover image: Work by Foundy Co. for Pixabay.com.